Rajashree Ghosh has worked in the field of social development with strong competence in gender, education, health, and environment. She has worked for the United Nations World Food Programme in India and has utilized a consultative approach to create synergy between Government, non-profit and multilateral agencies. She has translated her expertise into advising policy, documentation and action research in remote corners of India and beyond. With an academic background in Sociology, she has combined knowledge in theory and practical experience gained in India and the U.S.
At the WSRC, her research project raises key issues related to land tenure in informal urban settlements in India. This collaborative project seeks to provide “an opportunity for urban justice,” through providing strategic recommendations to reduce gender gap in existing planning frameworks. Along with partner organizations, Rajashree will take on this vital and imminent need to enhance women’s security of tenure. The project supports advocacy at grassroots level and informs policy on redressing discrepancies in women’s land ownership rights in urban contemporary India. 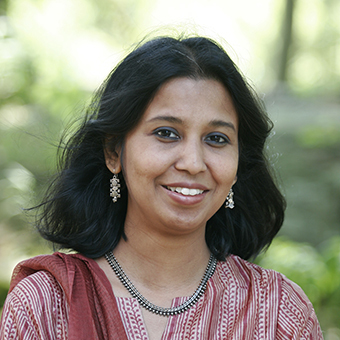 The WSRC project represents Rajashree’s interest in gender issues in specific cultural contexts. She continues to maintain strong ties with her community and plans on a sustained global discourse on gender. Situated in the Indian context my project focuses on gender inequities that plague its urban landscape. Slum-dwellers in urban India are disregarded as citizens and lack voice and visibility. The project is particularly inclusive of emerging initiatives combating violence against women in underserved urban areas. Additionally, along with strategic partners, our efforts inform policy on advancing women’s rights to land.